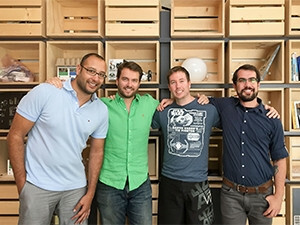 Cape's founding team from left to right: Fouad Zreik, David Wilson, Ross Douglas and Michael Champanis. A Cape Town- and San Francisco-based start-up, formerly known as Asimmetric, has changed its name to Cape, and introduced new products today. The start-up made headlines in September last year when it became the first South African company to join San Francisco hardware accelerator programme, Highway1. According to David Wilson, co-founder and CEO of Asimmetric, Cape raised millions of dollars in seed funding from Silicon Valley venture capitalists earlier this year. Today, the emerging company introduced the Cape Sensor and Dashboard, which it says is "the simplest way for IT and network professionals to monitor WiFi network and application quality". It says the Cape Sensor monitors WiFi network and application performance 24/7 by behaving like a real user and reporting issues in real-time before users complain. The start-up notes Cape Sensors take seconds to install and are designed with aesthetics suitable for offices, hotels, hospitals, shopping centres and other venues where people rely on WiFi. The sensors come with features such as mobile connectivity and power backup. It adds the Cape Dashboard is the "simplest WiFi dashboard for IT and network professionals. With just five main traffic lights, the dashboard is radical departure from traditional monitoring tools." The dashboard is cloud-based and requires no on-premises installation. "Bringing any new product to market is challenging, and that is particularly the case when it is a new type of product that nobody has seen before, and even more so when it includes hardware that you need to design and manufacture from scratch," Wilson says. "We want to help IT and network managers make the Internet work better for everyone. We're starting with a simple way to monitor WiFi quality, because that is a pain point for so many people, and we have big plans after that." He explains that Asimmetric was founded to help IT and network professionals make WiFi, and the Internet, better for everyone. "Millions of people run WiFi networks across the world, but most existing network tools are complex, intimidating and aimed only at experts. We wanted a simple way to assure WiFi is working perfectly. So, we've spent tens of thousands of hours making our Sensors and Dashboards super-easy to set-up, easy to learn and easy to use." Wilson explains the start-up changed its name to Cape because it wants the name to reflect the simplicity it is working towards every day with its product. "Cape also honours our origin. We founded our company in Cape Town, South Africa, where we spent more than a year designing, coding and soldering in a friend's basement, and where we continue to grow our engineering teams. "Finally, a cape symbolises heroism. As WiFi becomes ever more critical, we're all relying on IT and network pros working behind the scenes, often without thanks, to fix problems, improve quality and make the Internet work better for all of us. We think that's heroic."